Mr. Shi grew up in poverty in southern Taiwan and has always loved music. Shi Wen-Long was a self taught, but very determined, violinist. Mr. Shi showed the same determination in building a petrochemical company, Chi Mei Group, into one of the largest petrochemical companies in the world. With that success, Mr. Shi has also become quite wealthy and has used his fortune to amass the world's largest collection of violin family instruments. 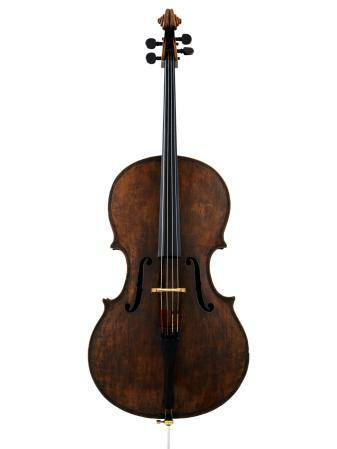 the 'Pawle' cello of 1730; a violin of 1722 that bears the illustrious names of Joachim, Elman and Suk; and the 'Viotti Marie Hall' violin of 1709.
eight instruments by the early Brescian maker Giovanni Paolo Maggini (including the world's only Maggini quartet), and a host of other Stradivaris, Guarneris, Amatis, exquisite French bows, and great violins by makers from France, Milan, Venice and Cremona. My favorite aspect of the Chi Mei collection is not the large amount of fine instruments they have accumulated, it is their generosity in loaning these great instruments to musicians and orchestras. It is wonderful that these great violins, violas, cellos, and bows are not silenced inside a glass case. They were made to be played. And many of them are! In fact, Chi Mei has become renowned as the the World's Most Generous Violin Lender. Before you get too excited, the lending is targeted (fittingly!) towards Taiwanese musical prodigies. But visiting soloists and orchestras have also borrowed instruments for performances in Taiwan. What a wonderful gift to the people and culture of Taiwan! If you are planning a trip to The Chi Mei Museum to view and study these great violins, it's best to contact the museum directly to make sure the instruments that you want to see are on display. It would be a long trip from the U.S. or Europe to Taiwan only to find out some or all of the collection was not available for public viewing. I really want to commend Shi Wen-Long and the people of Taiwan for collecting, sustaining, and loving such wonderful treasures of the violin world. Many more images and recordings of these fine instruments can be found on some wonderful websites- The Digital Violin Archive of the Chi Mei Museum, The Legend of Italian Violin Archive of the Chi Mei Museum, and Digital Taiwan. Two fine quality books with wonderful photographs and illustrations have been published by the Chi Mei Foundation- "The Chi Mei Collection of Fine Violins" and "Italian Violin Legend". Are you s violinist or interested in becoming one? Take a look at our Fine Violins!